Xenex Disinfection Services – world leader in pulsed xenon UV room disinfection systems for healthcare facilities. Xenex is in the news and facilities are using Xenex room disinfection systems. Facilities using Xenex room disinfection systems make the 2013 best hospitals list. Founded in 2008 Xenex has quickly become one of the leaders in the room disinfection industry. In just 5-10 minutes per room, their portable “robot” can eliminate the deadly microorganisms and super-bugs that cause infections. 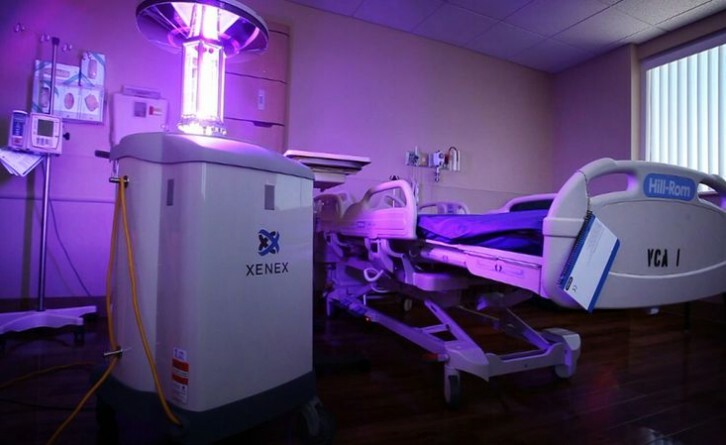 The Xenex patented pulse xenon UV room disinfection system is a pesticidal device for the advanced environmental cleaning of healthcare facilities. The Xenex system has been repeatedly shown to integrate smoothly into hospital cleaning operations because of its speed and ease of use. Healthcare associated infections (HAIs) are responsible for the deaths of nearly 300 people per day in the USA. Hospital disinfecting and environmental cleaning has become priority in controlling the spread of HAIs (i.e., C. diff., MRSA, Carbapenem-Resistant Enterobacteriaceae (CRE), Acinetobacter baumannii, etc.,). The Xenex mission is to eliminate bacteria, viruses, and spores in the patient environment that causes HAIs and to become the new standard method for disinfection in healthcare facilities worldwide. This entry was posted in Infection Control and tagged c diff, C diff disinfectant, UV disinfectant, Xenex Disinfection Services on August 16, 2013 by cdifffoundation.